It’s been a Beautiful Fall Day. 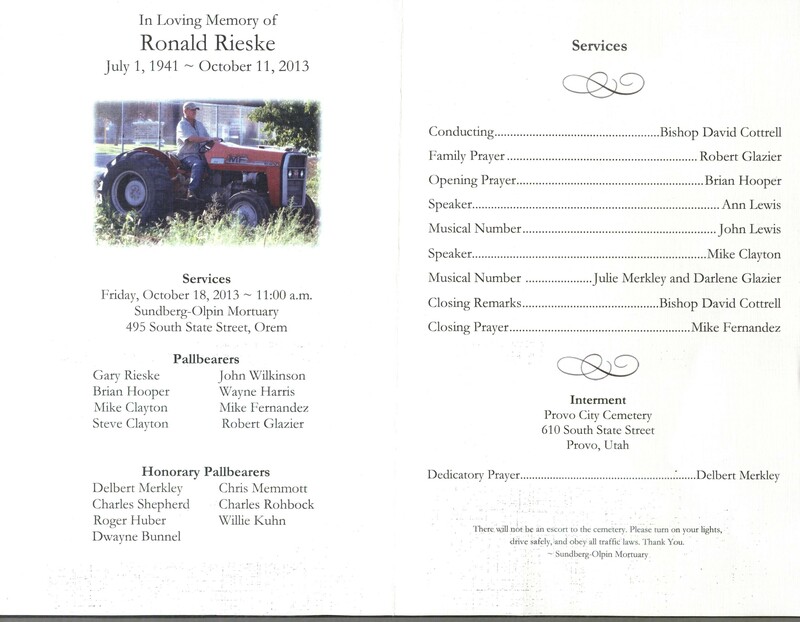 We honored and remembered our neighbor and friend, Farmer Ron. When we moved into the neighborhood 20 years ago, I was excited to be living across the street from a fruit grower (having grown up on a fruit farm in California). I went over to meet Ron Rieske, and we hit it off from the get-go. He was a bit crusty around the edges, but after a few visits, we were comfortable together. My kids were always afraid of Farmer Ron. We called him that because for them, “Mr. Rieske” was too formal and “Ron” wasn’t formal enough. “Brother Rieske” was out of the question. 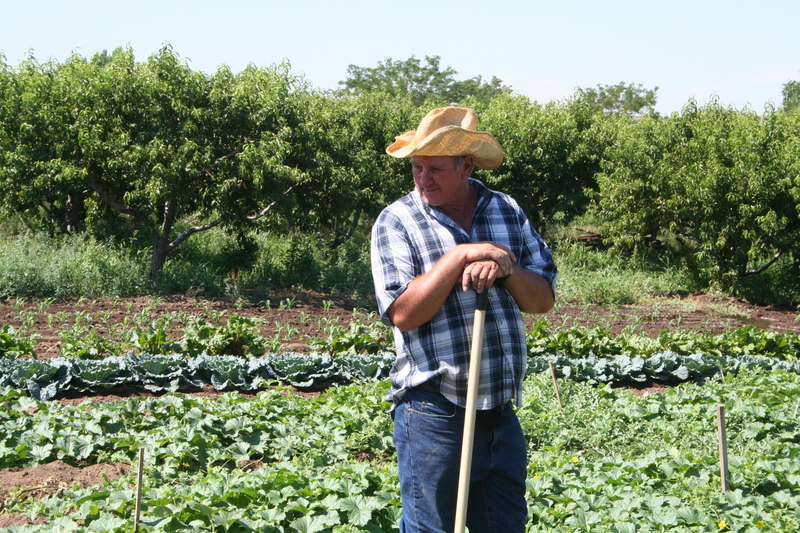 So Ron has been “Farmer Ron” to our family for 20 years. About 2 or 3 weeks ago as I was feeding Ron some lunch and visiting, he seemed in a good mood to talk about his past. 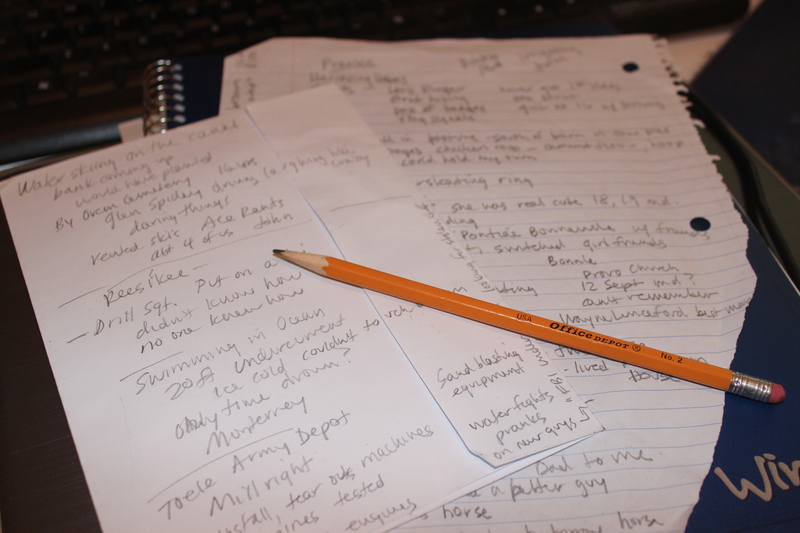 Something told me to grab a pencil and start writing. I found a couple of used envelopes, a dull pencil, and a torn sheet of notebook paper with some phone numbers on it, and I started collecting stories from Ron as fast as they came out of his mouth. For a couple of hours we talked and laughed, and I recorded story after story. Ron was born in 1941 and grew up here in Orem, on the farm across the street in what he called “the Barefoot Days.” He worked at the Tooele Army Depot for 33 years, retiring at 55 to come home and farm. He and his buddies were ornery rascals growing up. They were pranksters and trouble makers, always having a good time. He has some very funny stories about their antics. I captured as many as I could that afternoon, and it’s a good thing I did because within a few days the stories stopped and last week when Ron left us for good, the family asked me to speak at today’s funeral. They say when a person dies, it’s like a library burns down. I’ve been encouraging my Family History Class members to capture and record their personal stories. They’ve been sending them in to me to compile and share with the rest of the class. I can hardly bare the thought of these stories being lost to their families, simply because they were never recorded. I felt the importance of that today after the funeral as many friends and family members came up to me thanking me for the stories I shared–they had never heard some of them. It wasn’t a hard thing to do, really. It just took a determination to do it. So I am here to say to one and all: Just get out that paper and pen and begin writing YOUR fingers to the bone. Do it Now! Don’t die with your stories still in you. When you are gone, it may be all that is really left of you. Farewell, Farmer Ron. Your stories have already outlived you!